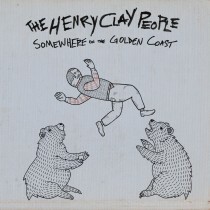 We know what you’re thinking: The Henry Clay People aren’t really from L.A., right? After all, their TBD debut, Somewhere on the Golden Coast, sounds like the riff-slinging byproduct of playing hard—and drinking even harder—in Midwestern bars that keep their jukeboxes stocked with old Pavement and Replacements records or whatever Robert Pollard released that week. Somewhere on the Golden Coast bottles that boundless live energy in 11 airtight tracks and 34 filler-free minutes. Listening closely, it’s easy to see how all of this started, how a revolving door of “crappy punk bands” led the Siara brothers to form The Henry Clay People in the first place. Two buzz-building albums (2006’s Blacklist the Kid With the Red Moustache and 2008’s For Cheap or For Free) and several lineup shifts later, they’re still keeping things simple. Recorded mostly at The Ship Studios in Eagle Rock, CA by Earlimart frontman Aaron Espinoza, he encouraged the band to ditch the headphones, take it easy on overdubs, drink more beer, and record live in the same room to tape. The idea was to get as close as possible to the essence of the live show. Golden Coast pushes and pulls between the two brother’s influences. Joey’s zeal for jagged distorted guitars (“Nobody Taught us to Quit), gets smoothed out by Andy’s laid back “drive into the sunset” love of The Byrds, Jackson Browne, and Grandaddy. The influence of the latter—along with their dad’s considerable classic rock collection—creeps into a couple Golden Coast cuts, lending a nostalgic from-dusk-’til-dawn feel to “A Temporary Fix” and the album’s melancholic curtain-closer, “Two Lives At the End of the Night.” Both of which provide a nice contrast to such certified piano-spiked jams as “Working Part Time,” “Your Famous Friends,” and “End of an Empire.” And since this particular long player barely eclipses the 30-minute mark, you better believe The Henry Clay People never wear out their welcome. In fact, they may just leave you wanting more.